Farmgirl Fare: Saturday Dose of Cute: Sometimes It's Safer. . . 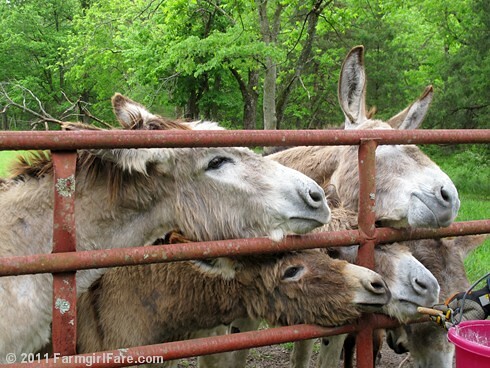 If you keep a gate between you and the donkeys at treat time. And it's always more entertaining! Around here, it's all about the treats. Don't believe me? Just click here and here. The Daily Donkey 97: Sheep Invade Donkeyland! © FarmgirlFare.com, the always hungry foodie farm blog where I keep telling my hunky farmguy he really needs to ditch those ridiculous technicolor terminator gloves—at least during photo shoots. I think they scare the animals. Okay, so they only scare me—but they clash with everything. I figured the gloves were to save his fingers!! LOL!! Easier to find one when it's lost. You'll like this great donkey story! Sweet, sweet Donkeys! They love their treats! Love the donkey pics! (Actually, love all of your pictures!) And that rooster is so handsome! We get all the fun photos of farm life (and you get all the hard work!) - hardly seems quite fair, does it? But thanks - we love all of it, and I often wish I could just come visit and give you a helping hand. Ooh, but he has such snake hips! The donkey's are so cute, and they are sure enjoying their treats. I don't think the gloves scare them at all at this point. I love your farm pics! I'm just wondering, what in the world do you do with all those donkeys? I hide behind the gate when I hand out horse treats too.